Located on a fully serviced site (paid until August 7, 2019) in Marine Park. Fully loaded Heritage Glen 300BH has 3 slides for a large kitchen with island, living room, dining table, bathroom/en-suite, master bedroom with queen size bed, large bunk room 2 single bunks and a leather couch that folds out to a double bed. Trailer also has power awning, outside kitchen, solid countertops and an 8x10 patio. See pictures and contact for details. Beautiful, well maintained fifth wheel. We can deliver to any Newfoundland location. Currently located at Shriners RV Park in Eastport. 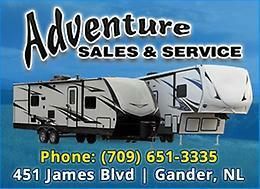 Electric fireplace, washer/dryer, central vacuum, 5000 watt generator, air conditioned, king size bed, and sofa bed. Beautiful 2005 Citation trailer on a large lot overlooking a small pond in magnificent Marine Drive Park in Pouch Cove. Now you can have a summer "cabin" within reach of the city - only a 25-minute drive and you're in the country! The trailer has been meticulously maintained - clean, no odours. Sleeps four comfortably, six if required (pull-out bed) with its large master bedroom in the front and two bunk beds in the back. Slideout is in great working order. A new valve was installed on the hot water tank in October 2018. Beautiful attached patio with outdoor cooler and bar overlooks the pond and there's a fire pit nearby to make sure you can take the maximum advantage of your evenings at the "cabin". Marine Drive Park has many amenities, including a lakeside swimming beach and snack bar. Park fees are due in the early summer. Everything comes with the trailer - table and four chairs, dishes, cutlery, bed linens, pots and pans, etc. Everything you need to walk right in and make yourself at home! This is your opportunity to get away from it all - all summer! For sale, 2011 Keystone Sprinter, Model 311 BHS. Trailer is in mint condition and has been stored indoors from October - May in each year since purchased in 2011. Unit sleeps 10 persons. It is also equipped with a bunk house and outdoor kitchen. Please email or call 782-1892 for further details, additional pictures etc. 2014 Keystone Hideout. Includes: patio, hitch, fire pit, 2020 permit, park game set. Already set up on quite road at Marine Park. Transferring of site to be approved by the park owner. Springdale 303 2011 same as new inside. Only used a couple times been parked for 3 years now never used. 2014 40' 5TH WHEEL TRAILER , EXCELLENT CONDITION (New $75,000) Parked at Backside Pond Park , at a sesonal site Deck included with BBQ for anyone interested Trailer is loaded , with lots of storage and sleeps 7 to 9 people. Everything works perfect 4 slides 2 Bathrooms full size fridge and oven washer /dry This trailer is fully loaded , to many options to list. Please do not email, as I’m posting for someone else. Please call number provided. 2010 Jayflight travel trailer. Comes fully stocked. Dishes/ patio table/mini fridge etc. Located at Stillwater park. Site available if wanted. :::::NEW PICTURES:::: FOR SALE 37 FT. MALLARD TRAILER 2005 USED IN A PARK FOR 2 SUMMERS HAS 2 BEDROOMS SLEEPS 10 PEOPLE HAS PATIO DOOR,HOT AIR FURNACE CENTRAL AIR,EVERY THING YOU WANT IN A PARK MODEL TRAILER AL YOU NEED IS A PLACE TO SET IT UP AND YOU HAVE A HOME AWAY FROM HOME ALL IN EXCELLENT CONDITION SELLING BECAUSE OF MEDICAL REASONS. Price reduced to $16,500.00 firm. FOR MORE INFORMATION PLEASE CALL 433 2268. 2014 Fuzion Chrome Toyhauler: Bought new in Aug 2016. Trailer is mint. Trailer comes with duel A/C, microwave/convection oven, fireplace, sleeps 10, patio with fence, new storage cover(never used), built in Onan generator, fuel station for toys, and large garage to fit 2 full size motorcycles. Trailer is located in Stillwater RV Park near Hopeall,TB. Priced to sell @ $72,000.00. New trailers of this size and quality sell online for $100,000.00 US online.